Mingma Norbu Sherpa Memorial Scholarships have been set up at Lincoln University, New Zealand for students from the Himalayas who want to pursue a Masters Degree in Forestry, Environment and Natural Resource Management. This scholarship will be available to 2 students every two years. The scholarship was established to continue the deep connection between New Zealand and Nepal, especially in the Sagarmatha region, stemming from New Zealand and Sir Edmund Hillary’s relationship with the Sherpa people. Mingma himself was educated at the first of Sir Ed’s schools and later went to New Zealand where he graduated with a Parks and Recreation Diploma from Lincoln College. Mingma was well known in New Zealand conservation and mountain circles and enjoyed a special friendship with Sir Ed. This scholarship is made possible through the partnership with Lincoln University, the Mingma Norbu Sherpa Memorial Fund, and the Greater Himalayas Foundation. Tuition is being generously provided by Lincoln University, New Zealand. The Mingma Norbu Sherpa Memorial Fund, held by WWF New Zealand, provides partial support for student’s stipend/living costs. The fund will be administered by a small steering group including Dave Bamford, Director of Tourism Resource Consultants, Bruce Jefferies of IUCN/World Commission Protected Areas (WCPA), David Simmons, Professor of Tourism at Lincoln University, Lisa Choegyal (New Zealand Honorary Consul and GHF Board Member) and Chris Howe, Executive Director of WWF-New Zealand, along with chair of the fund, Jo Breese. The Greater Himalayas Foundation provides funding for advertising, student airfare, and medical insurance. This scholarship is intended to support young individuals from the Himalayan mountain regions who are committed to the future of environmental protection and sustainable natural resource management in the Himalayas. The Greater Himalayas Foundation is working with the World Wildlife Fund to realize Mingma Norbu Sherpa’s vision of conservation that is rooted in local leadership. The sustainable protection of Bhutan’s biodiverse and vulnerable landscape requires conservation solutions that are championed by and appropriate to its local cultures and communities. 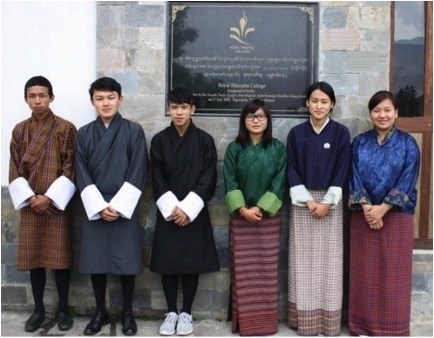 In Mingma's memory, the Greater Himalayas Foundation has established a scholarship in Environmental Management at the Royal Thimphu College in Bhutan. This scholarship will help prepare outstanding conservationists to take on the multifaceted environmental issues facing their community and country. The scholarship will be given to Bhutanese students, with priority given to candidates from remote communities and disadvantaged backgrounds. The Greater Himalayas Plus Two Scholarship Program supports students from remote Himalayan communities in Nepal who are interested in pursuing the 11th and 12th grade in any field of studies. A minimum of one scholarship student is selected each year. Priorities are given to students with financial needs and from rural mountainous regions.